In 14 of Javi Martinez's 16 Bundesliga appearances this season, Bayern have walked away with all three points. Before their draw against FC Schalke 04 on Saturday afternoon, FC Bayern München were proving unstoppable. However, while they did drop points against the Royal Blues the league leaders also managed to extend their lead at top of the table as they target a record 26th Bundesliga title. Want Javi Martinez in your Official Bundesliga Fantasy team? Sign him up here! A man at the centre of the action all season has been Javi Martinez. The Spaniard spoke exclusively to bundesliga.com to discuss Bayern and the Bundesliga’s development as well as a very particular hobby of his. bundesliga.com: Javi Martinez, as an international player, you probably have a better viewpoint than most as to how the Bundesliga is seen abroad? 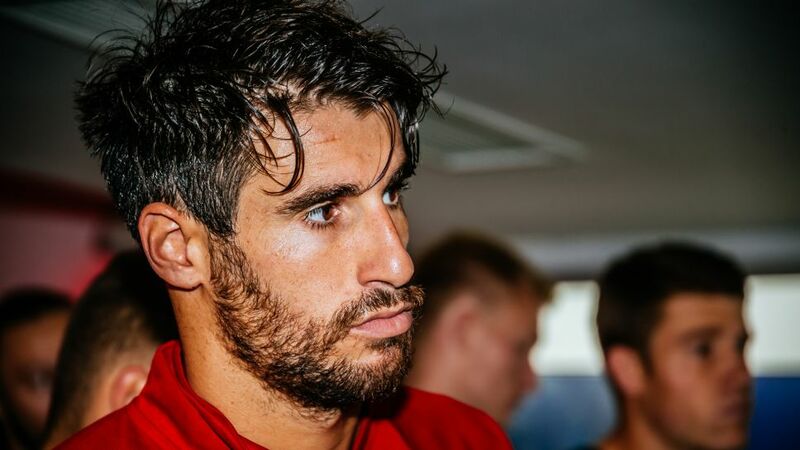 Javi Martinez: It’s very positive. Not only are FC Bayern München seen favourably around the world but the Bundesliga is as a whole. The league is always developing and improving. It may in fact may be the world’s best league when it comes to spectators and fans. I know no other country where the fans are so great and the stadiums are so full. bundesliga.com: Where do you see even more potential for growth? Martinez: I believe the best is yet to come. I can imagine that many more big international players will be coming to the Bundesliga. It’s a tight race between the big leagues in Europe but the Bundesliga is definitely in the top 3.
bundesliga.com: Which are your top 3? Martinez: I see three very strong leagues, including the Spanish La Liga and the English Premier League alongside the Bundesliga. What makes the Bundesliga stand out though is that all the clubs are very well organised and all are difficult to beat. Every games is a challenge - that’s what makes it so interesting. bundesliga.com: FC Bayern is a symbol of the Bundesliga for many. Where do you see your club now Carlo Ancelotti has taken over from Pep Guardiola? The style of play has changed with some saying Bayern are no longer as dominant. Martinez: We have not reached our best, but there is certainly a great amount of potential. In all games that have been close or a particular challenge, both the team and coach have proven themselves. We as a club know we can deliver when the game is tight. Watch: Look back at Bayern's Matchday 18 victory against SV Werder Bremen. bundesliga.com: Bayern are about to face their first knockout game against opponents Arsenal in the Champions League. What do you think you need to do to win this duel? Martinez: It is key that as a team we work and play well. In games of this level, yes it is important to score goals, but in order to that you have to make sure that all the teams’ components are working well. I see the team on a good path which will take us very far. We are in the race for three titles and in all competitions we have a chance to win. bundesliga.com: You are considered to be a consistent and reliable player who hardly makes any mistakes, nevertheless, the impression is that you are not quite perceived as a Bayern star. The names of attacking players such as Franck Ribery or Arjen Robben are more prominent. Does that bother you? Martinez: ...the best is to finish every weekend with a victory and three points. That is the most important thing for me. What excites me in team sports is the challenge to put all the parts of the team together and see it work as a whole. bundesliga.com: We heard that you are a very good basketball player, would you have preferred to be a basketball pro? Martinez: There came a day where I had to decide, football or basketball, and I’m glad I chose football. I played a lot of basketball in my youth and won some regional titles with my team and at 17 played for Athletic Bilbao, but now it is just a hobby. bundesliga.com: For a number of years you struggled with injuries to your knee, how is it today? Martinez: It’s very good and I have little to worry about. There was a time when I could only make 15 games in a season. Now, thanks to the medical department and treating physicians, I am able to deal with a much greater burden which I am thrilled about. bundesliga.com: Finally, let’s ask you a 'private question': Who is your favourite basketball team? Martinez: Well, of course I keep my fingers crossed for Bayern’s basketball players but in the NBA, the Chicago Bulls have always been my favourite. For all the latest news from the FC Bayern München camp click here!